For me, pasta is more of a delivery vehicle for a favorite sauce, rather than an excitement unto itself. Sure, there are gourmet flavored pastas, which I do enjoy from time to time, but for the most part, I don’t find pasta all that interesting. A few years back, I discovered spaghetti squash and realized it was an excellent substitute for spaghetti when served with a tomato-meat sauce. I liked the texture, I liked the flavor, and I found it tasted better than noodles. What I didn’t like was the hassle of cooking it, cutting it, and scraping out the strands. So when I discovered an inexpensive little kitchen gadget that would allow me to turn many vegetables into spirals, I had to get it. 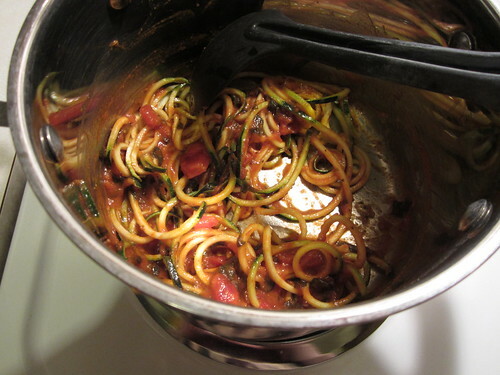 I used it for the first time mere days after it arrived, to turn zucchini into curly “pasta”. 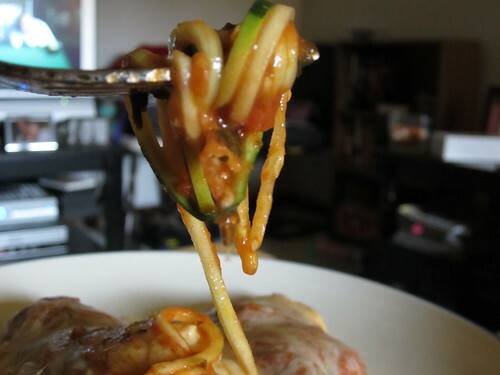 I tossed the zucchini with some store-bought sauce and served it alongside an easy chicken parmesan. For a little extra flavor, I dredged the chicken cutlets in shredded parmesan seasoned with Italian seasoning and ground pepper before cooking them. If you have an abundance of zucchini you don’t know what to do with, turning it into “noodles” is an easy, interesting way to use up some of it. Since I just picked up my produce box yesterday and found it filled with zucchini, you can bet I will be making more meals like this one. 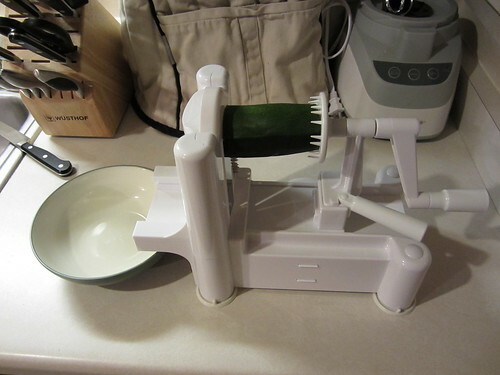 If you’re interested in a spiral vegetable slicer, I’m very happy with this one; it’s easy to use and easy to clean, and it stores the various blades in the gadget itself. Heat pasta sauce in medium saucepan over medium heat. While that’s warming, cut the stem end off your zucchini. Depending on the size of the zucchini, you may need to cut then in half, as well. Make sure the suction cups have secured the gadget onto your counter, and place a bowl to the left of the gadget to catch the zucchini strands. Push a flat end onto the circular piece by the blade, then push the spikes into the other end. Your right hand will rotate the zucchini, while your left hand will push the lower handle towards the blade. 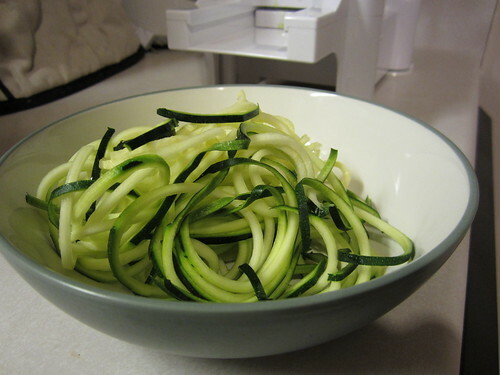 Continue with each additional piece of zucchini until you’ve spiralized all the zucchini. Toss the “noodles” in with the warmed sauce, let sit in pan for 1 minute to warm through slightly. Remove from heat and serve. 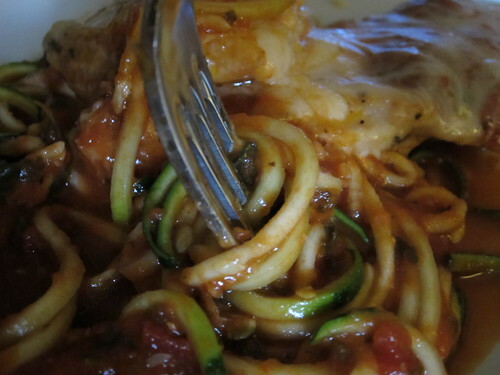 I love replacing pasta with zucchini – so much healthier and more satisfying. I usually just use the shredding disc on my food processor, though. Oh, I still use my food processor for shredding a large volume of zucchini. I did that just yesterday, so I could stock my freezer with zucchini bread from the larger squash. 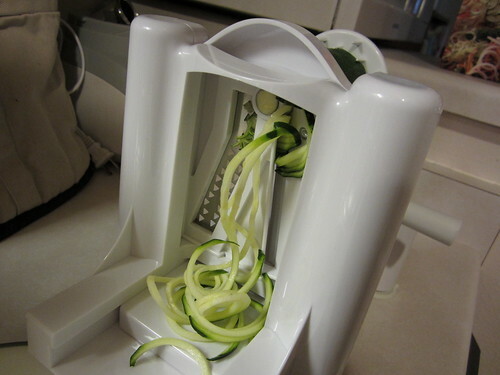 But, I have to admit, I like the length better of the zucchini strands from the spiral vegetable slicer – more like pasta, and I can clean it much faster. Oh my gosh! YES! I love Zucchini, I bet this is wonderful! This is great! I just ordered the slicer from your store. I’m COMPLETELY bombarded with zucchini lately and have been writing about it on my blog. Zucchini noodles have got to be the next thing. I’ll make your zucchini muffins while I wait for the new gadget – thanks! How do you like it so far?? ?